Pluto, which has been demoted as the 9th planet to merely another minor planet in 2006 has been found to have another moon. This brings the total amount of moons to 4. Recently Pluto was found to have more moons than just Charon, now named Nix and Hydra. This most recent moon will not be named until it’s orbit has been more closely observed but is now known only as S/2011(134340). This will be a boon to the New Horizons project which has already launched a probe to Pluto which will be arriving in the year 2015. 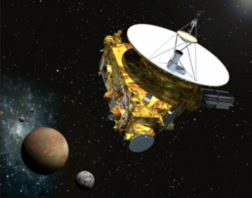 The New Horizons probe is currently half-way to Pluto at the moment. Now that we know about the new moon, we should be able to get close up pictures when the New Horizons probe does a fly-by of the Minor Planet. This new moon is only thought to be 8-21 miles in diameter in comparison to Hydra and Mix being 20-70 miles in diameter and Charon being about 750 miles in diameter.